Vagabundos, the DJ, club and event collective from Lucianoʼs Cadenza stable, returns for possibly its biggest year yet. Holding fort every Sunday at Ibizaʼs Pacha club over the last three years, as well as events in London, Chile, Bucharest, New York, Tokyo, Naples and more, the Vagabundos parties have earned them numerous accolades. 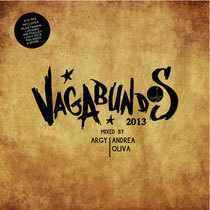 This double mix album from two of the Vagabundos DJs; Andrea Oliva and Argy starts the year off well. No stranger to the electronic music scene; Andrea Oliva has had a huge 12 months with releases on Cadenza, Saved, Be As One and DJ Sneakʼs Magnetic, whilst Argy continues to shine with his pure house sounds appearing on Ibadan, Versatile, Dennis Ferrerʼs Objektivity and his own These Days label, the duo join together to mix two-hours plus of Vagabundos vibes. Taking a disc each, Argy gets straight down to business, maintaining the energy already set by Oliva. As the mixes flow, the music gets decidedly tougher, showing Argyʼs techno sensibilities with tracks and remixes from heavyweights like Kink, Christian Smith, Robert Hood, Technasia and Argy himself. Olivaʼs mix starts lightly with the deeper sounds of Shlomi Aber and quickly locks into a groove with music from artists like Nick Curly, Dan Ghenecia, Todd Terry (under his House Of Gypsies guise) and Loco Dice. The mix builds to a crescendo of Olivaʼs own remix of Luciano’s ‘Rise Of Angel’ and into one of electronic musicʼs most classic contemporary pieces, ‘Knights Of The Jaguar by DJ Rolando. It’s out end of March.